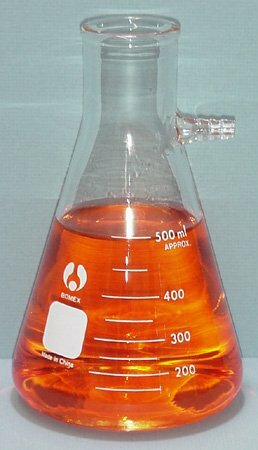 View More In Filtering Flasks. Made from Borosilicate Glass with tubulation/side arm. Sturdy wall, and heavy rim. Accepts hose with 3/8" inside diameter. Texas Residents: Under Texas State Law, this product requires a Precursor Chemical/Laboratory Apparatus NAR-120 permit to ship to a Texas address. After purchase, the seller will contact you via email to verify your permit. Failure to provide a valid permit will result in a cancellation and refund of your order.